Interior inspiration, decorating, home tours, expert tips and more! I never thought I would downsize once again. When I moved into my last place in Montreal, I thought 515 sq. ft. was as small as it was going to get. I was wrong. Everyone knows that moving to New York is expensive—but one can never really fathom how much you’re faced with signing a lease on an apartment that’s less than half the size and more than three times the price of your old rent. But as cheesy as it sounds, I wouldn’t have traded this tiny space for the world. On moving day, I sat in my empty 280 sq. ft. apartment wondering if I had lost my mind to move into a space so insanely small—but there was one thing I knew for sure—I wanted to be here. And as things kept trickling in as the movers unloaded the truck, one thing became immediately apparent: I owned way too much stuff. It took a while to make this place my own. Between long hours at the office and a complete feeling of hopelessness in front of the accumulating clutter in my tiny space (not to mention the overwhelming amount of better things to do in the city that never sleeps), I put off decorating my New York apartment for much too long. I read Marie Kondo’s Spark Joy (and subsequently threw out/donated a ton of stuff I didn’t need), I spent countless hours looking for the perfect sofa (which I eventually found in the Commune collection for West Elm), and put off installing blinds for way too long—especially considering The Shade Store made it the easiest process ever and, in turn, the best decision I made in the space. Around Thanksgiving, my apartment was finally in a place where I was 100% comfortable to come home without feeling like I needed to decorate, hang art, or declutter. And then, one morning in December, I got an email from my broker—your building has decided to sell your apartment, and you’ll have to move out at the end of your lease—no! I was barely done decorating, had only lived in my space for a few months, and had finally fallen in love with the place. Reluctantly, I started looking for a new place (and saw a lot of underwhelming apartments before finding my new one). I’ll still miss my first New York apartment—some parts more than others. I’ll miss the beams of sunlight streaming in from every angle on weekend mornings and coming home to my own glorified hotel room. I will not miss the tiny bathroom where I bumped into things more times that I care to admit, the insanely loud banging of steam radiators in the middle of the night, or the absurdly slow 1920s elevator that smelled of peppermint and moth balls. 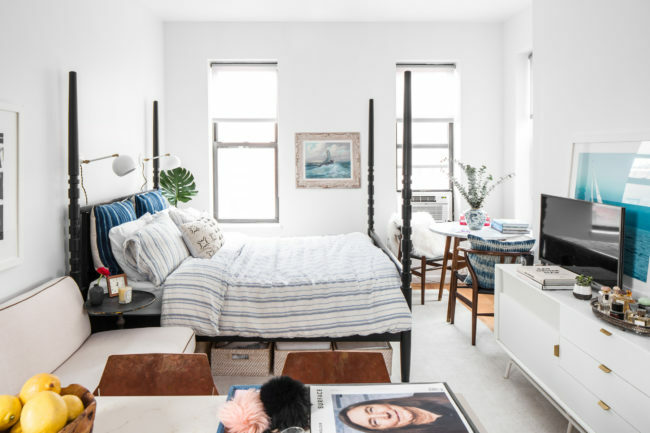 But if New York has taught me anything (and by anything I mean a lot), it’s how to live in a small space and love it (and you can read all about it on MyDomaine). The apartment is layered with vintage Berber Moroccan rugs collected by Caroline Gayral, owner of Fragments in Paris—a shop known for its exquisite selection of preloved Beni Ourain Moroccan rugs. Over the restored 19th Century parquet, the colorful carpets add a worldly flair to an otherwise perfectly European home: marble fireplace, modern heirlooms, family antiques, and a discerning art collection. It was after her daughter’s birth that Gayral and her husband transformed this period apartment into their family home, which may explain the touches of dusty pink throughout—offset by midcentury chairs in tan and burgundy leather, and touches of pitch black. The kitchen is a wonderful blend of muddy peach walls and glossy navy cabinets with patterned cement floors and glazed ceramic tiles. The bedroom is deceptively simple with only a Vertigo pendant lamp acting as a focal point showstopper. 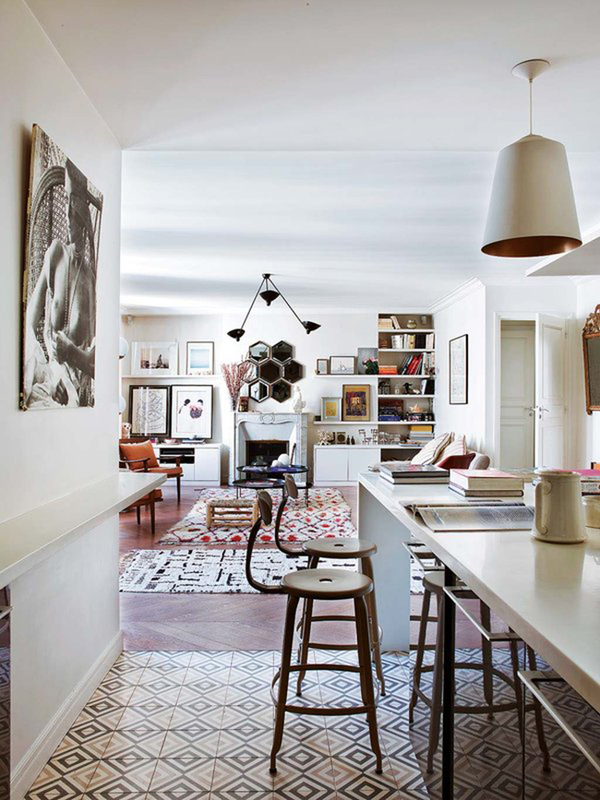 The result: a chic, layered Parisian home that’s not too feminine, but soft, family-friendly, and lived-in. Some décors are so perfect, they feel like they could be immortalized in time and never feel out of date. 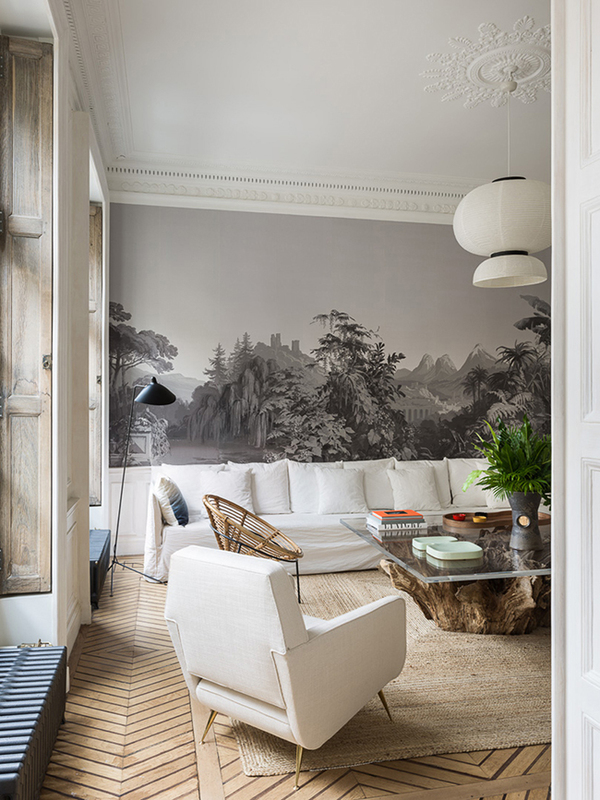 Such is the case with this Parisian pied-à-terre, which somehow successfully managed to blend stark modernism with classicism, and a sleek city edge with a coastal appeal. In this Haussmannian apartment, neoclassical and Greek influences offset the clean lines of the monochromatic furniture. Studio Razavi, who worked on the renovation, was determined to meticulously bring the apartment back to its former glory—all while firmly planting it in the present. Sylvie Acker chose the furnishings. To call a 2,400 sq. ft. apartment a “pied-à-terre” (literally translated as ‘foot on the ground’, in other words, a small apartment to use on occasion when in a particular city) seems wildly inaccurate—but such is the luxury of the few that collect Serge Mouille lighting, Beni Ourain carpets, and Jean Prouvé chairs with effortless ease. For the time being, the rest of us can continue to dream.